In 1970, Motown was experiencing sea changes. Diana Ross went solo while the Supremes went Top 10 without her. Jacksonmania was in full effect. Stevie Wonder began producing himself. Rare Earth had an unexpected hit and so did the Miracles, forcing Smokey Robinson to put on hold his departure from the group. Tammi Terrell died, finally succumbing to the effects of a brain tumor. Marvin Gaye was refusing to record or perform, but he produced another hit for the Originals. Los Angeles producer Frank Wilson had established himself in Detroit and set about creating a concept album for the Four Tops. In addition, Motown’s core staff had moved into the Motown Center building on Woodward Avenue. The company closed its Artist Development Department. That year is encapsulated in the 6-disc set The Complete Motown Singles, Vol. 10: 1970, the latest in the acclaimed series documenting every single released by Motown during its Detroit era. Volume 10 chronicles the exhilarating start of a new decade, with 145 tracks accompanied by our biggest booklet yet, at 148 pages. 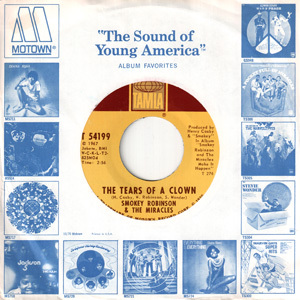 The unique “album” design again features a 45 RPM single representing the volume’s year: this time, it’s “The Tears Of A Clown" by Smokey Robinson & the Miracles, their No. 1 pop hit that took everyone in the company by surprise. There’s so much more: promotion-only mixes and rare tracks, such as the Supremes’ “Life Beats,” which was set aside for “Up The Ladder To The Roof,” and a cherished local hit by songwriter/producer Ivy Jo Hunter, “I Remember When (Dedicated To Beverly),” et al. Rare photos, memorabilia and stories from those who were there populate the booklet. This is Volume 10 of a 12-part box series. Carving out the narrative is an introduction by famed artist manager John Reid, who was then Tamla Motown’s label manager in the U.K. and was part of the team that made “The Tears Of A Clown” an unexpected No. 1 on both sides of the Atlantic. Duke University’s Mark Anthony Neal provides the historical overview. Once again, the booklet includes track-by-track annotations as well as deeply researched stories behind the songs by Keith Hughes and Bill Dahl. The Complete Motown Singles Volume 10: 1970. A 6-disc set chronicling the exhilarating start of a new decade.